We now take a break from your regularly scheduled post-rock review to bring you some metal. I often talk about metal here, but the problem lately has simply been a lack of interesting new metal releases to review. This year has been surprisingly short on new metal that I like, as opposed to say 2010-when dozens of bands I enjoy released new music. One of the standouts this year from the metal genre has been the brand new album from Australia's Be'lakor. To get a feel for what this band truly sounds like, let me refer you to the more popular bringers of melodic, progressive doom metal Insomnium. 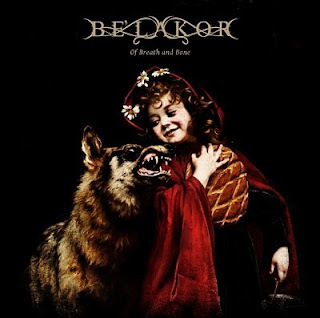 Be'lakor's sound is as close as you can get to being a carbon copy of the aforementioned band, but much more progressive in sound and structure. The vocals this band employ contrast with the doomier elements in that they are excessively harsh and guttural. The style of vocals you hear with this band are mid-range growls that sound neither like black metal howling nor Cookie Monster grunts. This singer can also hold notes with this vocal style as long as the music dictates, leading to a more interesting listening experience. There are many bands that play a similar style of metal to Be'lakor, but few who do it so well. I compared them to Insomnium, but I actually enjoy this band more than I do Insomnium. It is good enough to nod your head to, angry enough to sound appealing, and melodic enough to be memorable. I found their previous release, "Stone's Reach" to be powerful. "Of Breath and Bone" promises the same power, but show the band further refining their sound. If you are into metal music, especially with harsh vocals, check out this album. Listen below. Thanks for listening!